Imagine this happening in Nuuk. Yeh, right. 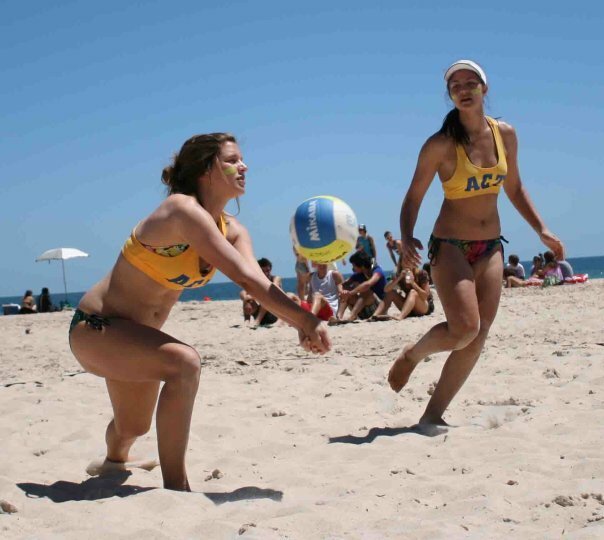 You might not see bikinis, board shorts or palm trees, but the far-fetched idea of playing beach volleyball in the Arctic will soon become a reality in Greenland’s capital, Nuuk. Just add sand, right? Enter Project Nuuk Playground. In an earlier post about concrete playgrounds, I hinted that I was mildly involved in big plans to amend the lack of recreational space for youth in the centre. I swear I didn’t realise that the project would be called this! When the notorious building Block P (a large apartment block which housed one per cent of Greenland’s entire population) was knocked down late last year, the local Semersooq council took the opportunity to address the needs of its city. It planned to develop a youth social hub. Well, it’s Day 4 since the project began and there has already been so much progress! Yes, I know, that doesn’t look like a sandpit, or at least, it looks rather bumpy! The sand plans will come in at a later phase of the project. From what I understand, Nuuk Playground aims to enhance the much-needed sense of community space for the young. It also provides a healthy form of entertainment for the boys here, so that they don’t get in other forms of trouble. It’s a project that the council is delivering upon consultation with the community and support from local organisations. Red Cross Greenland’s youth arm INUA is helping by organising a volunteer base. Children from as young as seven years have embraced the project as their own – by helping to build it! 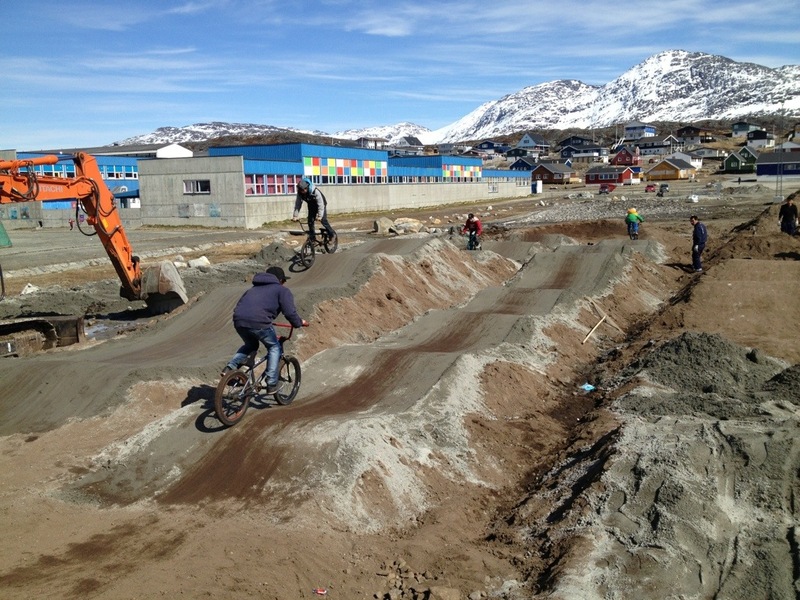 BMX biking is very popular in Greenland, so it was fitting that the first phase of the project underway was to build a dirt jump track for bikers to ride and do tricks on (see video above). Flown in from Denmark was BMX dirt track builder Danny Sørensen, himself a downhill biking and BMX enthusiast. Sørensen completed a similar project in another Greenlandic city Sisimiut in 2011 and the project was so well-received that they invited him back to create another track in the Capital. Anarchy rules when kids are involved. I freaked out internally a few times when I saw how things were built around here, but it seems that the majority of Greenlanders are more chilled about ‘danger zones’. Hey, they teach their kids to shoot at an early age, and they play on construction, so they are just more comfortable with flying on the wild side. It would be an Australian occupational health and safety inspector’s nightmare though: the volunteers of all ages dirtied their hands moving rocks and forming the earth, very close to Sørensen and others who worked with heavy machinery. I’m glad to say that nothing untoward happened. One thing’s for sure – the kids enjoyed stamping on the earth and riding the tracks to flatten it out! Once the BMX dirt track is completed, construction for an obstacle course, a skater track and that elusive sandpit to play beach volleyball and handball will begin. The next Inuit Games will also be held in this space. A friend mentioned that she walked past it at 10pm at night, and with the sun still shining brightly there were 20 kids happily playing on the incomplete track. i think that just proves how much there is a need for more cool activities and spaces like this in Nuuk. So that more people feel welcome, Red Cross Greenland’s INUA also plans to organise social gatherings and activities for the youth centred around Nuuk Playground. If you are interested in hearing more or being involved, you can contact Elisa Leth, Youth Consultant from INUA on +299 32 18 00. P.S. This was written based on my impressions only. If I got any facts wrong, it’s entirely my fault. Kids of various ages helping out… or playing!